Do you have your P.E kit? Have you got your drumsticks? Did you pack your violin? There has been many a morning when I have discovered that one of the children has left there water bottle/swimming kit/pencil case *delete as appropriate* at home, typically right by the front door, and we have just fallen out of the car at the school gates. Well – no more! 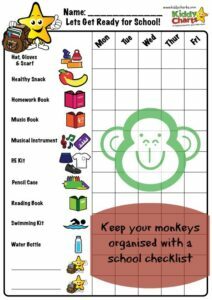 *ish* We have created a school checklist which can be pinned somewhere prominent at home and checked off as school bags are packed the night before, or probably in the morning before school. Alternatively, you can use the checklist as a permenant reminder, without ticking the items off at all, to make sure that whatever you need on that day is packed and ready to go; instead of being left in the washing machine, or sitting on your child’s bedroom floor in a heap still waiting to be washed. As we aren’t entirely sure what everyone needs every single morning for school – no we aren’t psychic – we have even given you a couple of spaces within the checklist to add your own items. In addition, we have somewhere for you to add names, just in case you need a few of these as you have more than one bundle of joy to get out of the door to school of a morning. As always, we have a little video for you to show you the school checklist printable in action – don’t forget to pop over to the KiddyCharts YouTube channel to subscribe, so you don’t miss any of our great free resources, we are hoping to create one every couple of weeks for you. Thanks for watching, and for reading – see you again soon. If you would like us to create anything for you, do drop us a line as well, we are always looking for fresh ideas for our free resources.